Command, the supreme air and naval simulation/war game has a new DLC for their LIVE series. The populist wave that has swept across the world has reached Japan. With a jittery economy and scandals in the previous government on the minds of the public the government that emerges following a set of of snap elections is more nationalist and populist than ever. The new prime minister has set his eyes on the long-disputed Kuril Islands, repeatedly claiming them for Tokyo in numerous speeches. The JGSDF has traditionally been concentrated in Hokkaido already, but airborne and amphibious units have moved there, obstensibly for exercises. The Russians, familiar with that excuse to concentrate forces, have become more suspicious than ever. Not helping the situation is raucous demonstrators on both sides sailing towards either the Kuriles or Hokkaido in small boats. Several have been killed and dozens more detained. The Russians have been slipping troops in, but an improvised convoy has been readied at Petropavlovsk-Kamchatsky to carry much heavier forces to Kunashir and Iturup. Should it reach the islands safely, the Japanese goal of taking them without excessive causalties will be impossible. On the other hand, if it's sunk, the Kuriles are Japan's for the taking. The stakes are thus extremely high. Due to the (previously) anti-invasion nature of the JSDF and the traditional Soviet/Russian defensive doctrine at sea, both sides have an impressive array of sea denial weapons. The question is which shall prove superior. Are submarines really that multi-functional? Speaking beyond the techno-thriller, it's no secret that the scope, design and fidelity of Command has earned the attention and patronage of the Pentagon. 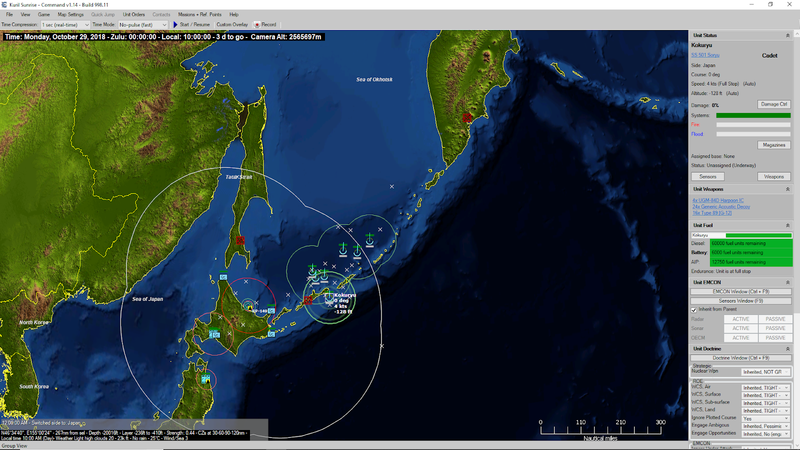 The value of this simulation goes beyond the regular sound bite of realism and transcends into serious real life questions of defense policy. In Kuril Sunrise, you will see Japan as a nation struggling on its way to a fully-vested maritime nation. The DLC is literally a stress test of the real life Japan's 2004 National Defense Program, with three of the major bullet points: improving the destroyer, submarine and air combat forces. It's up to you to come up with an answer. Interesting, I thought that it was a very one side thing a conflict between them, but looking the forces confronted and the narrow the conflict it could be a mini 1905 all over again. 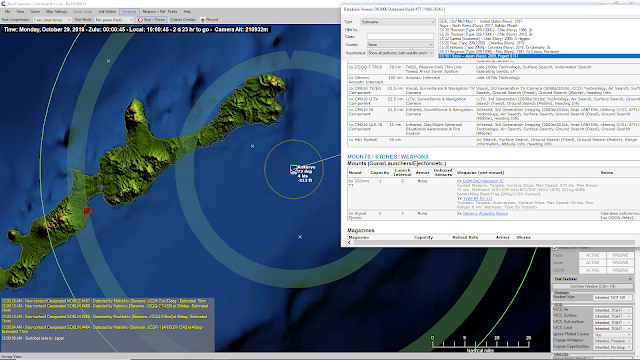 Perhaps it's a little too narrow as some AAR made clear (the target is a convoy after all).